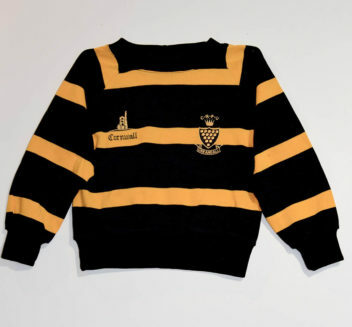 Cornish Rugby Shirt Baby Retro Design. Round necked polyester/cotton long sleeved top. Black with gold horizontal stripes. Gold embroidered “CRFU” (Cornish Rugby Football Union) and tin mine emblem. Size: 22″-approx age 9-18 months. Cornish Colours rugby shirts were introduced in 1885.Wearing this shirt links you to Silver Medal winners – the only county side to represent GB at rugby in the Olympics(1908) – 13 times County Championship Finalists – Tony Cook – Roger Hosen – Brian “Stack” Stevens – Nicholas Tregurtha and many more great players. This legend accompanies each Rugby Shirt.